A while ago, Golden Dawn MPS submitted a parliamentary question asking to know how many non-Greek children are kept in Greek kindergardens. Emprosnet, a Lesvos local newspaper, reports a new target of the Fascist leaning party: non-Greek students. Ignoring the usual method of asking for information through the Ministry of Education or the Dean’s office one of their MPs addressed an e-mail to all the administrative offices of the University of the Aegean and to all its academic staff. In this brief note Mr. Iliopoulos wants to know the number of Greek and non-Greek students accommodated at the University residences. According to Emprosnet the message could have been an innocent oversight if the specific party and its practices were not known. The academic community of the Aegean University has tacitly agreed to leave the message unanswered. The leaders of the three parties which comprise the Greek government are still in a meeting trying to come to an agreement regarding the new austerity measures. The difficulty has risen due to the new labour laws proposed. Fotis Kouvelis’Democratic Left party has stated that they cannot agree with such measures while PASOK is hesitatingly discussing them. 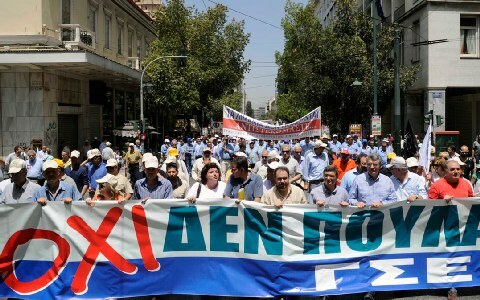 The new austerity measures, including the labour laws proposed, have to be ratified by the Greek Parliament. This move has already caused casualties: a New Democracy MP has been expelled from the party Parliamentary Group while a Demoocratic Left MP left his party’s Parliamentary Group on his own. Alexis Tsipras, leader of SYRIZA, stated during an interview that these will be the first austerity measures that will not be ratified by the Parliament. It is true that the Troika intervention in the private sector of the economy is regarded as utterly irregular and beyond their jurisdiction. 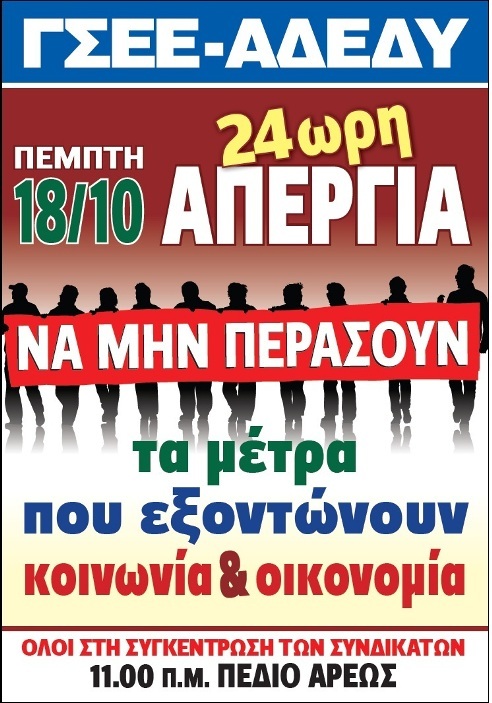 Today, 18 October 2012, Greece goes on general strike. Public and private sector employees, the small businesses, taxi drivers, public hospital doctors have announced their participation through their unions. Air traffic controllers will stop working between 10 and 13.00 to express their support to the strike. Aegean Airlines have announced two international flights cancellation while local flights will be jeopardised as well. Primary and High School teachers have joined the strike. Buses, metro and the urban train operate normally after 9 o’clock to allow the protesters to reach the gathering points. Trolleys will not work at all together with intercity trains (mainly the Athens Thessalonini network, from what one can gather from their statements). The strike has gained momentum due to the extremely harsh new austerity measures still under discussion within the government but also at the EU Summit Meeting taking place today. 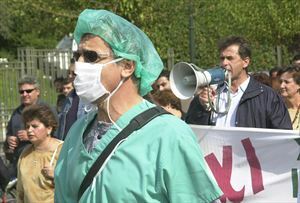 The demonstrators will gather at various points and as usual converge outside the Greek Parliament in Syntagma Square. 11 o’clock, in Pedion Areos (a square near the General Confederation of Greek Workers headquarters) is the official meeting point of the demonstrators. We shall report from there from now on. The major Greek workers unions for both the private and public sectors have called for a general strike in Greece on the 18th of October, the day of the Summit Meeting of the European Union. National hospital doctors have stated that their strike will start on the 17th and continue on the 18th. Shop owners and small family business are also taking part together with the taxi owners’association. Out of the many reports that one hears about racist (mainly..) attacks perpetrated against immigrants I chose to relate you the following: A young man of Greek Egyptian parentage got off the bus at a central spot in Athens. He was the only foreign looking passenger and thus a gang of 3 black dressed, chain waving thugs attacked him instantly swearing at him in Greek. He realised that they thought he was not Greek and started addressing them in Greek. The vicious attack continued while the dogs they had with them threatened to tear him to pieces. The victim managed to get away while the passers by remained passive, possibly frightened or just shocked. When the bleeding man reached the police station he was conducted to a hospital where it was confirmed that one of his eyes was so injured that he would never recover full sight again! This story struck me as I happen to have been born in Egypt myself. My Greek parents, who were also both born there, repatriated in 1956 and my father died saying that Egypt and its people were the best he had ever known. The man mentioned above also said that there are still many Greeks living in Cairo and Alexandria and they are treated as full citizens. I mention this to add to the already expressed, during the attack against HYTYRION theatre, position that extreme right thugs, under the umbrella of the Golden Dawn party and its Parliamentary representation, belief of mine that the racial hatred attacks are the heralds of much worse. Anyone who is not “with them” is against them and they are entitled, no, they are duty bound, to annihilate them. Greek society, living in a constant state of fear and shock, has been taken by surprise. It is my belief that the democratic reflexes of the vast majority of the citizens of this country will soon settle in. It is the duty of all progressive and democratic forces to join against this common danger.